Although we rented just as a couple, the villa is large and comfortable with private pool area and view of the ocean, so it is perfect for a relaxing vacation. The villa owner met us at the ferry and showed us the way to the villa (which was easy to find thereafter), which was very nice of him. The villa is quite new, so all of the furniture and kitchen appliances were in perfect condition. It was close to Plaka beach (0.5 KM) which is a wonderful sandy beach. Stelios, our host, was exceptional. He greeted us at the ferry, driving us to the property and checked in on occasion. The bedrooms are well appointed, uncluttered and functional. The beds are very comfortable. The kitchen, sitting area, patio and pool are all cleaned daily and met our every need. We had ample parking for both our crossover rental and the ATVs we secured. 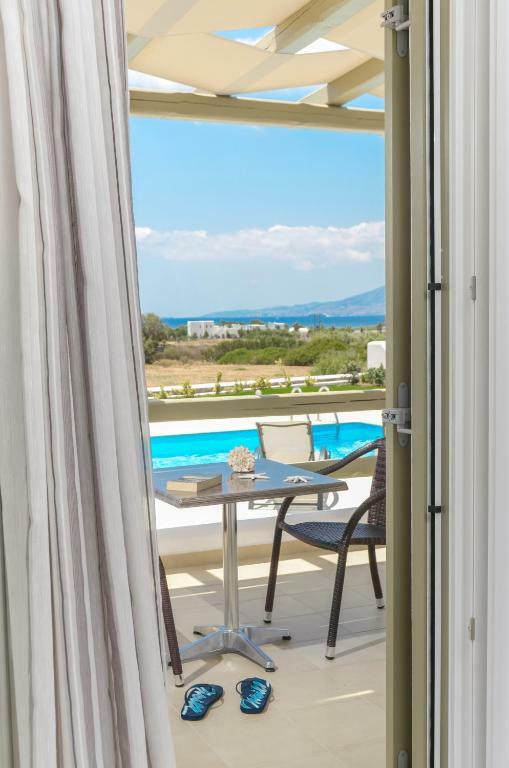 The property is a 2 minute ride, 7 minute walk to Plaka Beach. We are strongly considering making a stay at Sea & Olives an annual event! It was a delightful stay. Great accommodations with private pool as bonus. Fresh figs were provided and owner was very helpful. We didn’t just like it, we loved it. What a memorable stay, the property was immaculately maintained and cleaned every day. All cooking facilities were provided, dish washer and a washing machine. BBQ. Close to the beach and restaurants in Plaka beach area. The host Stelios and his wife were extremely accommodating and very professional. Villa was very private and we would recommend to anyone. We even extend our stay as we didn’t want to leave. Thank you Stelios and family for a very memorable holiday stay at your villa. Villa di recente costruzione, perfetta!!! Pulitissima, confortevole, cambio biancheria quotidiano e accortezze del proprietario a tutti i livelli!!! Ideale per una vacanza nella bellissima Naxos! Consigliatissimo!!! Πολύ καθαρό και με πολλές ανέσεις! !Ο οικοδεσπότης πολύ φιλόξενος!! Lock in a great price for Sea & Olives Villas – rated 9.7 by recent guests! One of our top picks in Plaka – and a guest favorite. Offering a garden, Sea & Olives Villas is set in an olive grove of 4.000 m2, in Plaka. They feature fully equipped units, each with a private pool and free WiFi. Plaka Beach is 1,950 feet away. Featuring a terrace, the accommodations is fitted with a seating area with and CD player. A flat-screen TV and DVD player are available in some units. There is also a kitchen, equipped with a dishwasher. An oven, a microwave and toaster are also featured, as well as a Nespresso coffee machine. There is a private bathroom with bath robes in every unit. Bed linen is available. Several restaurants, cafe bars and mini markets can be found just a 5-minute walk away. 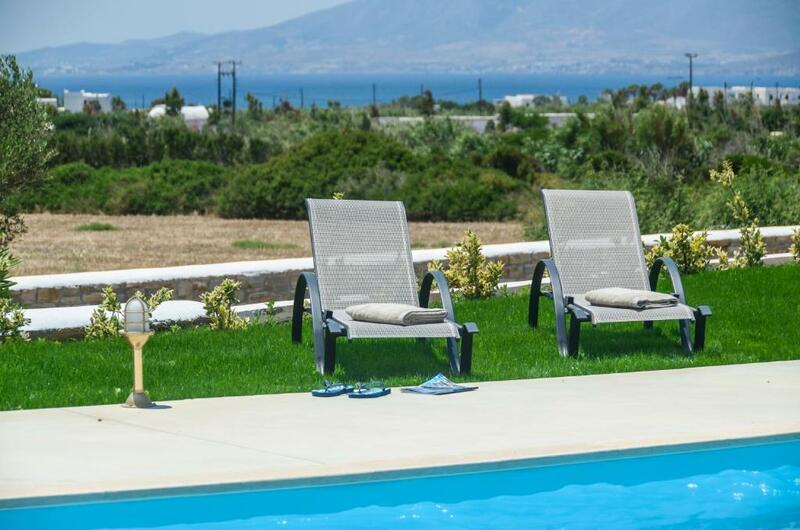 The nearest airport is Naxos Island National Airport, 1.2 mi from Sea & Olives Villas. Chora of Naxos is 3.1 mi away. Free private parking is available on site. This property is also rated for the best value in Plaka! Guests are getting more for their money when compared to other properties in this city. When would you like to stay at Sea & Olives Villas? This holiday home features a balcony, patio and soundproofing. Please note that 1 bedroom is located on the ground level and 2 are located underground. House Rules Sea & Olives Villas takes special requests – add in the next step! Sea &amp; Olives Villas accepts these cards and reserves the right to temporarily hold an amount prior to arrival. Sea & Olives Villas accepts these cards and reserves the right to temporarily hold an amount prior to arrival. That we had to leave ! It was a little difficult to get around without a car. However, the walk does one lots of good! The location was perfect for us, but people should be aware that it is located in an quiet area a few KM from Naxos town, so we recommend renting a car. People should also be aware that the villa is located next to open fields and a working family farm. We found it to be very charming to hear the sheep, goats, cows, roosters, etc., but others may not be so fond of the more rural atmosphere. Small suggestion... A small table and chair combo on the roof terrace would have added a nice touch. The sunset view is stunning up there! Something to consider? But that is small & shouldn't deflect from the wonderful 5 day stay we enjoyed! Our family had a lovely time at the Sea and Olives Villa. The hospitality shown by the owner Stelios was amazing, nothing was an issue. The walk to the beach was a little further than we would have liked but was beautiful once you got there and the pool at the villa was perfect for a cool off.